How has the Great Spotted Kiwi adapted? Great Spotted Kiwis seem to have made a deal with evolution, as their harsh environment keeps many of their predators away. They are generally found high up in the hills, where it is tough for pigs, dogs, ferrets, and stoats to survive. Kiwis are nocturnal birds, mostly because of the intrusion by predators during the day. When introduced into habitats without predators, kiwis are spotted during day as well as night. In their natural habitat, however, it is easier to escape predation at night because they cannot be seen as well. 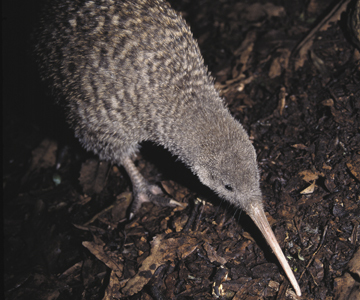 Great Spotted Kiwis have an enhanced sense of smell, which is very strange in birds. They are the only birds with nostrils on the end of their long beaks. Their long beaks allow them to dig and reach the insects, grubs, seeds, and small invertebrates in the ground. The nostrils at the end of the beaks allow them to find food in the ground without actually seeing it. They are flightless birds, but unlike most flightless birds, they have no keel on the breastbone to anchor the wing muscles, and have basically no wings. The wings are so small that they are invisible under the hair-like feathers. Kiwis are actually more like mammals than birds in some ways. Most birds have hollow bones so they weigh less and make flight possible. Kiwis, on the other hand, have marrow in their bones. Since they have no chance of being able to fly, they do not need hollow bones to save weight. Great Spotted Kiwis are the largest of the Kiwis. Because of this, they have been able to escape predation easier than their smaller relatives, the Little Spotted Kiwis. Males are 45 cm tall, with a bill length of 90-100 mm. Females are 50 cm tall, with a bill length of 110-120 mm. They are pear-shaped and have small heads and necks, with long slender bills. They have a plumage composed of soft, hair-like feathers, which have no aftershafts. The plumage can range from charcoal gray to light brown. They have powerful legs and claws, which are used for defense.